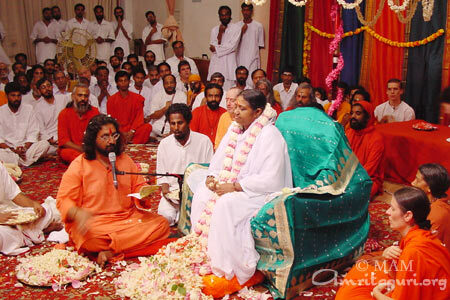 It took five minutes for Swamiji to perform the pada puja for Amma on Guru Purnima. 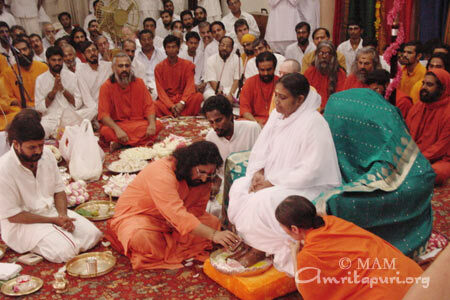 It took 10 minutes for him to chant Amma’s 108 Names and, handful-by-handful, to cover our Guru’s Feet in flower petals. Five minutes after that, all Mother’s swamis and swaminis had garlanded Her, and so had both of Her parents — whom She then rose to embrace. So it took basically 20 minutes for the rituals of Guru Purnima to be accomplished. But the day had not ended. It was just beginning. From the chair where She sat for the rituals, Mother moved forward to a low peetham near the front of the stage. 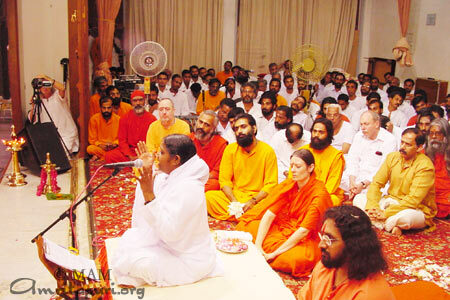 There, after prostrating to the thousands of people in attendance, She delivered a satsang on the nature of the Guru. In that talk, She spoke of lessons She had learned from her own mother, Damayanti Amma. 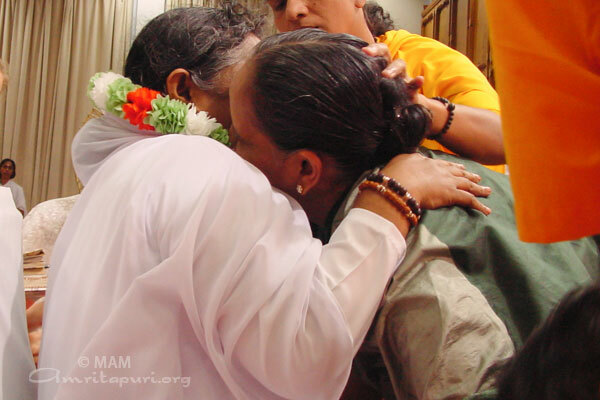 “Though she didn’t have any spiritual understanding, she was able to guide me,” Amma said. Damayanti Amma might give some strict directive, and Amma would find a spiritual principle in it. For this reason, Amma explained, She sometimes calls Damayanti Amma Her guru. For the rest of Wednesday, the 24th of July, Guru Purnima, Amma showed (as She has so many times before!) that She took this lesson to heart. After 10 minutes’ guided meditation, She again stood, the low peetham was exchanged for the darshan bench, and She sat and began hugging. Hugging is work? One remembers a reporter back in America, who, hearing of “The Hugging Saint,” said, “Hugging? Who couldn’t do that? Heck, I could hug people for a living…” He changed his song after he watched Her. Throughout, Amma smiles, scolds, comforts, jokes, advises, laughs, cries… gives whatever response is suited to the person in Her lap at the moment. And along with all this, She is conferring with an AIMS Hospital official sitting to Her right, beside the bench, and acknowledging the presence of a devotee who has the privilege of handing Her prasad from Her left side — a different devotee each minute-and-a-half. She is listening to the live bhajans being sung, leading applause for the little child who sings for Her, and hurling a handful of sweets at the tabla player who has missed the beat. Her ever-watchful eyes are attending to everything going on in the hall: an elderly man has no place to sit comfortably, and She calls a brahmachari to lead him to a chair; some people are being told it is too late to join the queue and She sends word to let them come to Her; a devotee from far away finds no place to sit on the stage near Her, and She directs some ashramites to move, making space for such visitors. All this, and every few seconds a new person in Her lap. This goes on until all who have come for Her darshan have been hugged. On this Guru Purnima day, that meant 10 straight hours. Evening bhajans were held while the hugging continued, and at 9:00 the arati lamp was being waved in front of Mother, still on the darshan cot, while She washed Her Hands before feeding a child its first rice. Less than half an hour for the rites of honouring the Guru; 10 hours for the Guru to bless and serve Her children. But never mind; Amma was getting Her Heart’s desire. For here is something else that She said in Her Guru Purnima satsang: It is better to get worn out rather than rust away. This is what Amma desires. After returning from Her US Tour, some of the first things Amma talked about were the devotion, surrender and self-sacrifice of Her American children. Amma then told one anecdote about a television reporter who asked Her if She ever gets bored doing the same thing day after day. 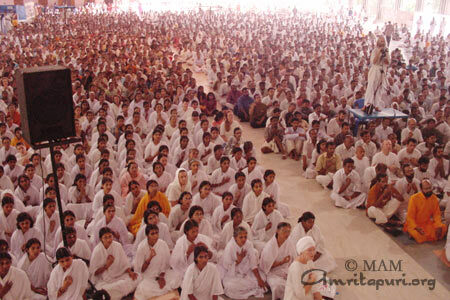 Amma repeated Her response to the disciple and devotees assembled. Amma said, “If the river gets bored by flowing, if the sun gets bored by shining, then Amma also gets bored.” Amma added that She doesn’t know the word “boredom.” She sees everyone as Her own Self. After that Amma said that there are many stories from the US Tour that She wants to share, but that She is saving them for another time. One could hear the excitement in the temple bell as it sounded — three times in quick succession. It hadn’t rung thus in more than two months. Three bells means Amma. Amma had returned from Her US Tour. Actually, the scene was much the same as it was back in May — hundreds of Amma’s children packed around the stairs to Her room, waiting. But whereas in May everyone was waiting to say goodbye, this time, it was to say hello. Soon Amma’s car pulled into the courtyard. Within moments She was moving through the sea of disciples and devotees towards Her stairs. 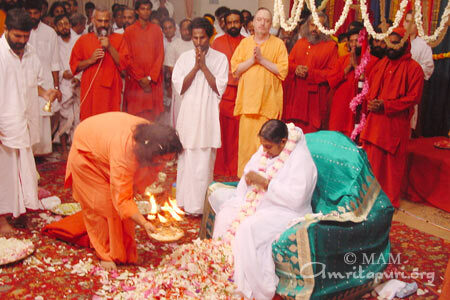 For those at some distance, Her progress could be marked by a single red flower, which Amma twirled over Her head. Once on the stairs, She took the video camera from the ashram photographer and began filming the crowd. Her smile was contagious. Many devotees were calling out “Amma! Amma!” Then one lady shouted, “Amma, bless me with discrimination!” Amma’s wit was sharp, “If you are eating in the dark, do you put the food accidentally into your eyes, into your ears? You have discrimination for such things. 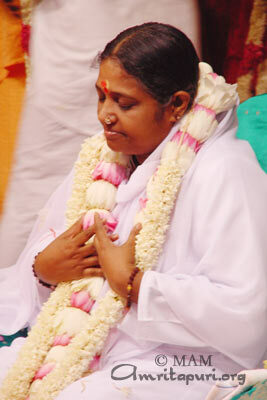 Why can’t you use it in other circumstances?” Amma beamed at everyone for a while longer and then walked into Her room. A few more moments, a few more laughs, a few more smiles. Then Amma disappeared behind Her curtain. When little kids get together, being little kids, each is immersed in his or her own wants. After all, “Let me!” and “I want to!” and “Me first!” are some of the first sentences children learn. It was really no different in Rhode Island when the little ones gathered for the “Children’s Puja” while the older folks were in the hall for Amma’s puja before Devi Bhava. They really did try to raise their hands and take turns when they were asked to suggest names for Amma that could be used in their chanting. The adults would, of course, hear Swamiji chanting “Om Sri Matre Namah” and would reply “Om Parashaktyai Namah,” and then he would say “Om Sri Maha Ragnyai Namah” and then they would respond as before. But those Sanskrit chants are hard for kids to pronounce — never mind to understand! So for their puja, they make up names of Amma: “Om Amma Who Gives Us Chocolate” was one, and “Om Amma Who Hugs and Kisses Us” was another. And there was “Om Amma Who Snuggles Us.” And more. And everyone had an idea — or two or three — and trying to remember to take turns and be polite was a little hard. With the Names finished, it was time for Devi Bhava. One of the adults draped a small girl in a red sari; a felt crown was placed on her head. Another child garlanded her, and a third child held a cheerful pink parasol over her. Beside this Little Amma knelt another youngster, holding a small dish of sandal paste; another child was ready to hand her prasad — banana pieces or Triscuits. In front, to the sides, knelt other children, in “the lap position”: they would help the “devotees” in the line approach Little Amma, receive her darshan, and move away. Little Amma reached out for the first child in the queue, and everything changed. She grew still and calm; the others did too. They stayed quietly in a line that just naturally formed, and they watched her with the same kind of intentness with which they watch the real Amma when they’re moving towards her in the darshan queue. Little Amma pulled the first child close, rubbed his back, whispered something into his ear, touched a bit of sandal paste to his forehead, looked into his eyes, handed him a piece of banana, and gently pushed him away as she reached for the little girl just behind him. You had to be there to experience what was happening: little kids, moments ago vying for the privilege of dressing up like Devi, calling out “My turn! Me now!” came to the soft embrace of another child, and mysterious expressions came over their faces. Every few minutes, the Little Amma would get up, shed the sari and crown, and join the queue for darshan while another child would be transformed into Devi, and begin giving darshan. The new Little Devi would stroke whoever came to his or her embrace (even if it was someone with whom a tussle had been occurring just a moment before) and you could see that neither was remembering the competition; both were really living their parts. You can’t help wondering, watching this miracle of the children, what would happen in the adult world if we could be so simple and innocent, could see and be Amma, the way the kids did. The people ranged around Amma on the grassy hillside at Rhode Island’s Bryant College joined in the laughter, and the man kept gazing. This is the last of the five U.S. Summer Tour retreats; perhaps that (along with the binoculars!) is why Mother’s mind turned to distance, to separation; soon She’ll be leaving Her American children, to return home to India. More laughter; then a few soft smiles at the children nearby, and Mother and all those gathered grew silent, and meditated. Amma visited Iowa for the first time on the fifth of July, a Friday, the day after America’s Independence Day. Of the people who filled the hall, many had met Amma before, but the majority had not, and almost a thousand new children came to Mother that morning. Most of Mother’s new children looked very much like Americans all over the country, but one stood out dramatically because of what he wore on his head: the full, formal feather head-dress of a Native American Indian Chief. And that’s exactly what he was: Chief Wambli Sah Pah, whose name means Black Eagle, had come to present Her with an eagle feather from the Indian people. The eagle feather is one of the greatest honours that we give to a person, the Chief explained, for it represents the eagle that goes to the Great Creator for help and healing. Sah Pah, Chief of the Ponca tribe from the Nebraska/Missouri area, has worked very hard for his people: thirty years ago, the American government terminated his tribe, but he underwent severe austerities and sacrifices and interacted with the government in Washington DC to restore recognition for his tribe; this recognition was ultimately received in 1990. And now he had come to meet Amma. We’re developing our spirituality like it used to be in our culture, and I just came to present this (eagle feather) from the Indian people in honour of Her being here, and to ask that the Spirits continue helping Her as She helps the people. So saying, he approached Amma for Her darshan. Standing, he leaned forward and held out to Her the single black and white eagle feather. She took it, touched it to Her forehead and kissed it, and then opened Her arms to him. He leaned down for Her embrace, and two great hearts touched. 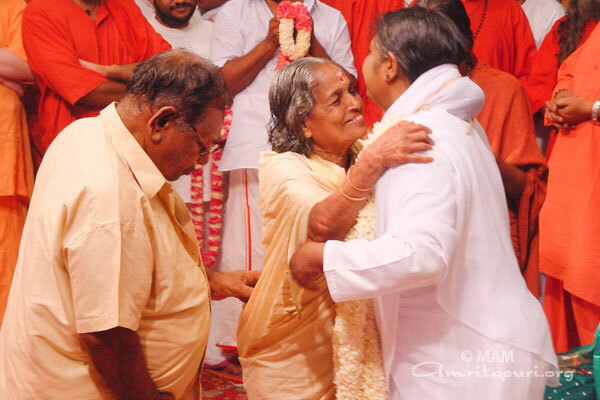 After his darshan, the Chief drew a comparison between Amma and the highly respected healers and spiritual leaders of his tradition: You look at our spirituality and this spirituality and it’s very similar, because you have holy people that can heal and they can bring together people, and our medicine people can do the same. Chief Sah Pah was clear about his respect for his own people and tradition, and for Amma: I think we’re all one people, we all believe in the Great Creator. She’s like one of our Medicine People. You know we have Medicine People that heal within our tribes, and that’s the honour we give to Her, as a person that brings enlightenment and healing —spiritual healing and physical healing and mental healing to the people around the world. So we’re thankful for that.